Happy House in New Ellerby, near Hull, Yorkshire sleeps 14 people. 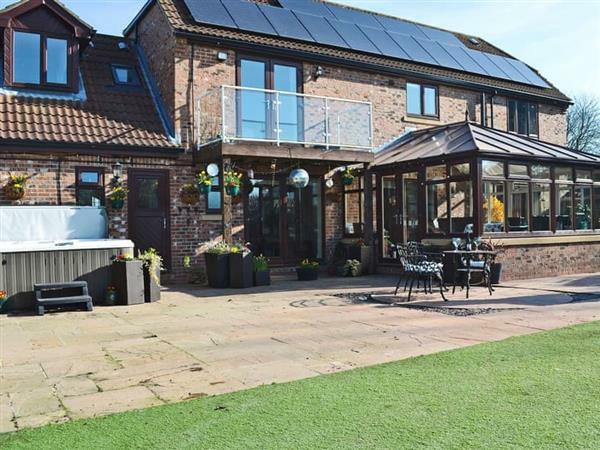 Happy House near Hull is in the village of New Ellerby, which lies between Hull and Bridlington, in the heart of the East Riding of Yorkshire and offers superb accommodation for large parties. Happy House is a lovely detached property, ideal for groups of friends or families wishing to spend quality time relaxing and enjoying each other’s company. With six bedrooms, including rooms specifically designed for children, this property has been furnished with flexibility in mind. The master bedroom houses a four poster bed and has en-suite facilities, whilst two further double bedrooms have use of a Jack and Jill en-suite bathroom. There is also one bunk and two twin bedrooms, one of which has a hidden play area. The main living room has a 70 Sky TV and deep, comfortable sofas making it the ideal spot to relax and unwind whilst watching your favourite film after a long day of exploring. This property also has use of two large kitchens, one of which is equipped with a wood burner, and both offer large social areas and overlook the garden. The main kitchen leads into a large conservatory where you will find the dining area with seating for up to fourteen guests. Both kitchens offer top quality facilities, perfect for the chef in the house to create mouth-watering dishes. If you are looking for a night off from catering for the family, the on-site pub provides a great selection of traditional dishes, and booking is highly recommended. Happy House is only a few miles from Rise Hall, bought by TV presenter Sarah Beeny and her husband in 2001, and featured in Channel 4’s Restoration Nightmare. Rise Hall plays host to some of the county’s largest weddings and events making Happy House a perfect base for those visiting. Whether you enjoy walking, cycling, exploring country mansions, bird watching or just watching the ever-changing tides of the many nearby beaches, your every need will be well catered for. The beautiful Yorkshire coastline is only 7½ miles away and offers sandy beaches, hidden coves, traditional seaside towns, towering cliffs and the RSPB reserve of Bempton Cliffs. The Yorkshire Wolds offer rolling countryside and is a great place to explore either on foot using the many footpaths and bridleways or by bicycle. This area is dotted with small villages and pretty market towns, and Beverley is under 20 miles away, and is considered one of the loveliest towns in the area, offering plenty of independent shops and boutiques lining narrow cobbled streets and small courtyards, with the large, gothic Beverley Minster towering over the town centre. Hull, voted UK City of Culture in 2017, is only 9 miles from Happy House, offering something for all the family from great shopping, theatres, live music venues, The Deep, art galleries pubs and some great restaurants. Happy House is ready and waiting for your group to come and make some amazing memories. The beach is 7½ miles from Happy House near Hull. With the shop 1 mile, and the pub & restaurant is only 10 yards from Happy House. Living room: With gas fire, 70 Sky TV and DVD player. Living room/kitchen 1: With wood burner, range with electric oven and gas hob, microwave, fridge, freezer, dishwasher and tiled floor. Dining room/conservatory: With tiled floor and French doors leading to conservatory. Bedroom 2: With four poster king-size bed, 42 Freeview TV and en-suite with shower cubicle and toilet. Bedroom 3: With king-size bed, 42 Freeview TV and en-suite with bath and toilet (Jack and Jill with bedroom 4). Bedroom 5: With twin beds and cabin bed. Gas underfloor central heating, gas, electricity, bed linen, towels, Wi-Fi and logs for wood burner included. Cot, highchair and stairgate. Welcome pack and doggy extras. Large, enclosed lawned garden with patio, garden furniture, barbecue and pizza oven. Hot tub (private). Bike store. Private parking for 7 cars. No smoking. Holidays at Happy House run from Friday to Friday. Pets allowed at Happy House. For a better idea of where Happy House is, you can see Happy House on the map below. Happy House is in North Humberside; should you be on the lookout for a special offer, you can find all the special offers in North Humberside. It's always worth checking to see what is on offer at the moment. Do you want to holiday near Happy House (UK10631), you can see other cottages within 25 miles of Happy House; have a look to find your perfect holiday location.